Delegates were unanimous in their praise for the speaker line-up, interesting and varied content and networking provided at the GrowQuip conference held on 1 November in Stratford upon Avon. Opening the conference, MEP Anthea McIntyre said she was delighted to be attending the conference and for the opportunity to update the commercial growing industry on work to date regarding Brexit and the issues it generated but that there was a long way to go before all of these were addressed satisfactorily. She confirmed she will work hard in highlighting to her colleagues in UK government and her European counterparts the continuing problems facing growers and farmers, especially with regard to Brexit. The audience was impressed by Ms McIntyre’s strong presentation. Another speaker, Steve McCurdy of Majestic Trees — despite a virus which left him with strained vocal chords — delivered an entertaining talk about how his business has developed and expanded impressively in only a decade. Jack Ward, BGA CEO, looked at areas where growers and farmers could perhaps take advantage of a new initiative from Michael Gove. Swiss apple grower Markus Kobelt of Lubera highlighted the benefits of cross- country collaboration with his fellow presenter, Feli Fernandez of NIAB EMR; while consultant Patrick Bastow and Professor Simon Pearson of Lincoln University brought the audience up to speed on innovations in vertical growing, LED lighting and light filters. Guy Moreton from one of the conference sponsors, Morepeople said “It was a really enjoyable day with really good speakers. I usually try to come away from a conference having learnt at least one new thing but GrowQuip delivered loads of interesting points and I came away with so much from the conference: we’re proud to have sponsored the event”. Other key sponsors concurred. “It was a good networking day for us and we were happy to be entertaining important clients at a well organised event”, said Andy Judd of Hortifeeds, while James Hayes of Bulrush commented “We were delighted to work in association with the Commercial Horticultural Association to provide a well organised and informative day. We had opportunities for a lot of conversations to get updates on the state of the industry and on our customers who were present. Thanks to the CHA team for organising this event”. 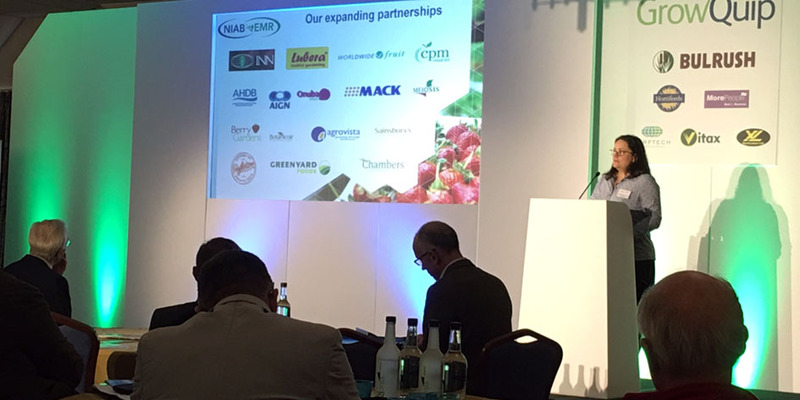 Summing up at the end of a busy day, CHA Chairman Neil Bragg emphasised the need for the industry to pull together in trying to solve its issues, including guiding Government on what assurances horticulture needs as suppliers and growers work towards Brexit.